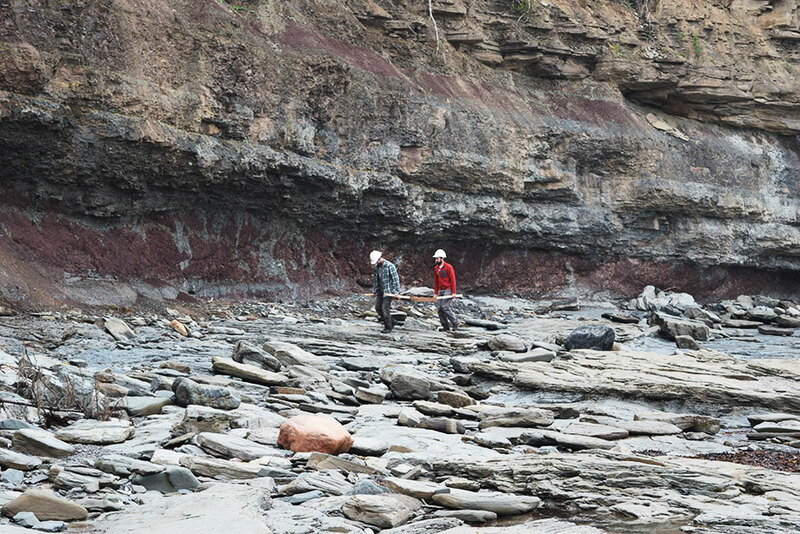 Mystery drives Nova Scotia fossil quest in tidal area where famed scientist once worked. The mood was celebratory on a remote, rock-strewn beach in Cape Breton, Nova Scotia. 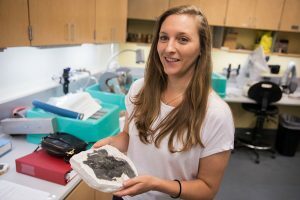 Stephanie Pierce and her paleontology team had uncovered a fossilized jaw measuring more than a foot and were snapping selfies when they were struck by a question. “Oh, my God, how are we going to get this out?” Pierce said, laughing. The curator of vertebrate paleontology at Harvard’s Museum of Comparative Zoology and assistant professor in the Department of Organismic and Evolutionary Biology was in Nova Scotia after winning a Putnam Expedition Grant to walk in the footsteps of Alfred Romer, a Harvard paleontologist and biologist for much of the 20th century who specialized in vertebrate evolution. An entire era of the fossil record is named after Romer, who identified the unexplained scarcity in tetrapod fossils from the early Carboniferous Period, when animals first crawled out of the ocean and walked on four legs. “Romer’s gap” spans the period 360-345 million years ago, and to this day remains a mystery. Guided by detailed field notes from Romer’s 1956 expedition combing Nova Scotia — the only site besides Scotland where terrestrial fossils from this period have been found — the group set out in June to retrace his steps and probe the area with fresh eyes. 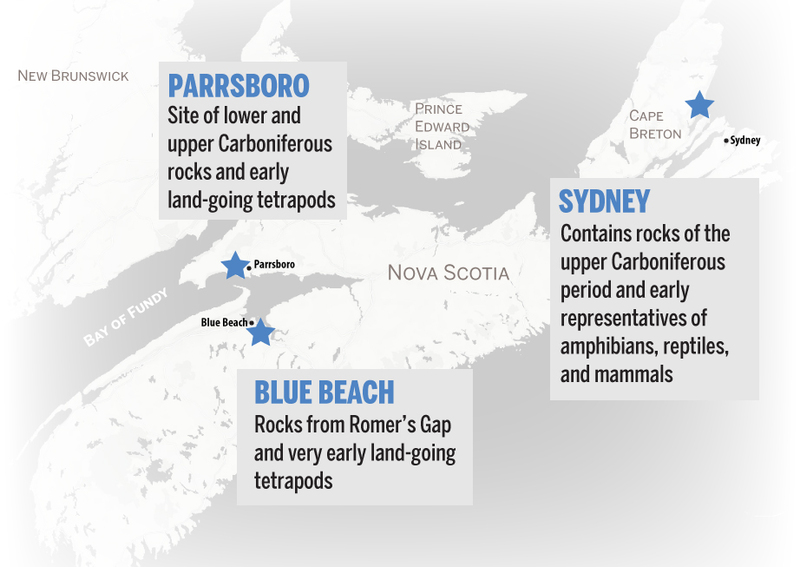 They hit three main areas: Parrsboro, Blue Beach, and Sydney. Erosion from decades of waves crashing ashore had altered the topography, but some things hadn’t changed since 1956. Romer’s notes contained a business card from an inn where his team had stayed, so in the spirit of tradition, Pierce’s crew slept there, too. 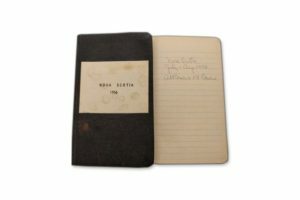 All members of the 2017 team also kept detailed field notes from their expedition, which will be archived alongside Romer’s at Harvard for future reference. 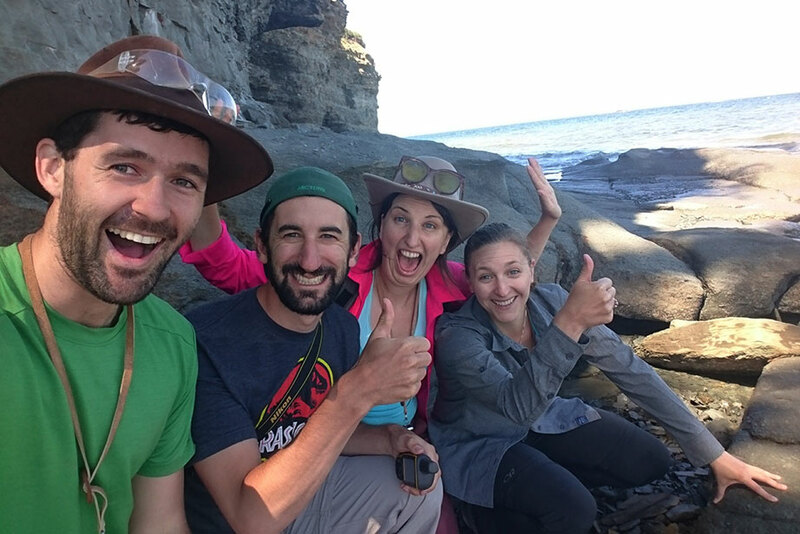 The team moved quickly each day along the rugged coast Romer had studied. 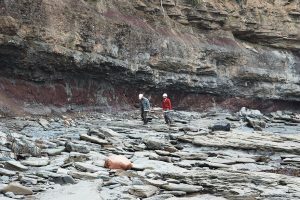 When they found fossils, there was little time to waste before they had to haul the heavy rocks back to their base, “bruised and battered, racing against the tide” — the Bay of Fundy has the world’s highest, with waves cresting up to 50 feet. 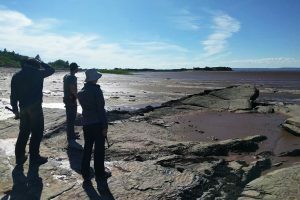 All the highs and lows of fossil hunting were in effect the day they trekked north to an uncharted site and tried to access a remote beach flanked by private property. They sought help from a friendly passerby, who, in a stroke of luck, happened to be the harbormaster. Soon she was sweeping them down an unmarked road in her vehicle to a largely unexplored stretch of beach. “It didn’t even look like it would be a fossil,” she said. But it was. Then they found another one, and another. The jewel was a jaw from a large tetrapod. 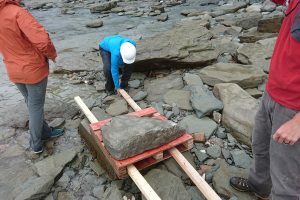 “The rock didn’t seem to be the type to have fossils in it, but something on the surface made me reach for it and take a closer look,” Pierce said. It took four people four hours to lug the fossils a little less than half a mile. But the slog was worth it. 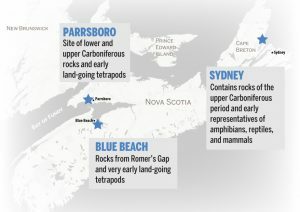 “I think we found something new for Nova Scotia Carboniferous tetrapod evolution,” Pierce said. This entry was posted in Biology, History. Bookmark the permalink.